Arriving in Newcastle early? There’s LOADS to do! Newcastle upon Tyne is a beautiful city, rich in heritage, and compact, easy and safe to walk around. If you get here early for OER14, there is plenty in and around the city to keep you busy, and there is also a plethora of great places to eat, drink and snack in the city centre. If you arrive by train, you will arrive into Central Station, a mere hop, skip and a jump away from the conference venue and hotel – you can walk in two minutes…. If arriving by plane, you will come into Newcastle Airport, and the best way to get to the venue and hotel is by taking the Metro from right inside the airport, to Central Station (journey time approx 30 minutes, cost about £4). From there it really is only two minutes to the venue/hotel. A taxi from the airport will cost around £20 and could take longer depending on traffic. The city centre is small – you can walk from one end to the other in less than 20 minutes – but our Metro system is an easy way to get around if you want to get out of the city centre. The coast is within in easy travelling distance and we have beautiful beaches including the Longsands and King Edwards Bay at Tynemouth (head to the Metro, recognisable by bright yellow M signs, and get a ticket to …. Tynemouth!). There you can get a lungful of sea air, grab a delicious hot cup of tea and stroll along clean sandy shores. You might even be lucky enough to surf, if the waves are in your favour. Careful though, its a bit chilly in the North Sea…. In Tynemouth Village, you can visit the picturesque Tynemouth Priory, and nearby the hot chocolate is to die for. One stop further on at Cullercoats and you can hire sea kayaks and bikes to explore further. Tynemouth also has a market in its victorian station (the Metro stop) every Saturday and Sunday where you can pick up bric a brac, local craft and homemade cakes. Back in the city, the OER14 conference venue, the Centre for Life, plays host to Maker Faire on Saturday and Sunday immediately before the conference. 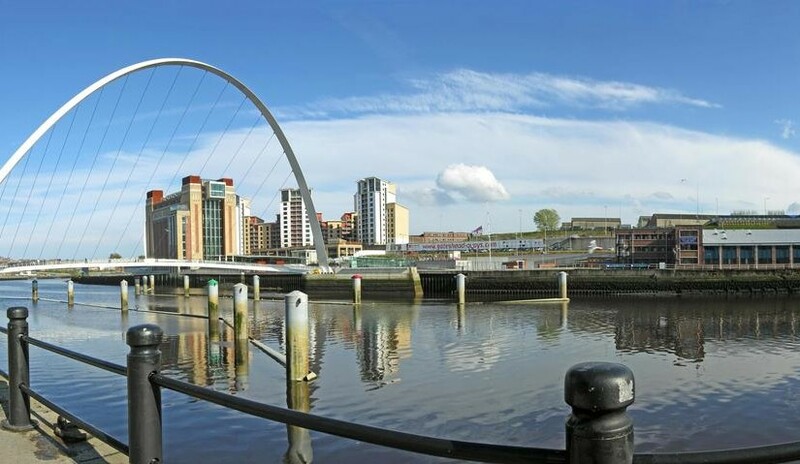 You could also stroll along the Tyne and nose around the Sunday Market on the Quayside in the morning. You will find loads of places en route to linger for a drink or something to eat, including the Bridge Tavern, which has its own microbrewery inside, and serves great food. Right opposite is the legendary Crown Posada, and just around the corner from there you will find a fine example of a Jacobean house at Bessie Surtees House. Up the hill there is the Castle Keep and Black Gate founded in 1168. If you are interested in churches, we have some very old ones like St Andrews, dating back to the 12th century, and two cathedrals, The Cathedral Church of St Nicholas and The Cathedral Church of St Mary – a fine example of the work of AW Pugin, who also designed the Houses of Parliament. Both have fine stained glass collections. Hidden away in the city centre you can also find Blackfriars, originally established in 1239 as a Dominican Friary, and now home to craft shops and a good restaurant (aim for Saturday to visit as most shops are closed on Sunday). If you like looking at art, there are the Hatton Gallery, and Laing Art Gallery, for more traditional art, and BALTIC (fantastic views down the Tyne from here, and worth a walk over the award winning Gateshead Millennium Bridge to get to it) and the Globe Gallery for contemporary art. If you are interested in even more ancient history and archaeology, Hadrian’s Wall is easy to get to and a designated World Heritage Site. Building began in AD122 and there are Roman forts easily reachable by Metro including Segedunum at Wallsend (where the Metro signs are in Latin! ), Arbeia at South Shields. Other places to wander to include the Quadrangle at Newcastle University, St James Park (Newcastle United football ground right in the middle of the city), and a worthwhile 12 minute train journey to the beautiful medieval city of Durham (and another World Heritage site) – where the magnificent Castle and Cathedral (built in 1093 to house the shrine of St Cuthbert) are well worth a trip to see. You will have to come back at a later date to take full advantage of the Northumberland coast, where you will need to make time to see places like Bamburgh Castle, Alnwick Castle, The Farne Islands and Lindisfarne as well as the Northumberland National Park and Kielder Observatory. Take a walk around our city, its worth exploring, and generally safe to wander around at night – and well known for its lively nightlife! This entry was posted in #oer14 by suzannehardy. Bookmark the permalink.